Viber is a free iPhone app the lets you make free calls to anyone who also has the Viber iPhone application installed on their iPhone. Calls on Viber are free and can be made over WiFi or 3G. Viber-to-Viber calls *are* free though they use your internet connection and or data plan. If you are on a WiFi network, you have nothing to worry about, but do watch your usage on 3G unless you do have the unlimited data plan. The Viber user interface is almost identical to the Phone app on your iPhone, with the exception of the purple theme, making learning how to use the app a no brainer. All your contacts, Favorites, Missed Calls and more are accessible from the app. Setting up Viber couldn’t be simpler. You just enter your iPhone number, the Viber service sends you a text message with a code, and you enter that code into the Viber app. That’s it! No registration, no logging in or out, it really couldn’t be any simpler. Although only calls to other Viber users are free, you can still use Viber to make and recieve calls to and from your non-viber friends using your phone’s minutes, and the app lets you send them a quick message asking them to install the iPhone app. Anyone that has the Viber app installed has the little Viber icon next to their name in the Contacts section. Now here’s the rub. If all you can do for free with Viber is call AT&T iPhone customers, and you already get iPhone to iPhone calls for free from AT&T, it defeats the purpose of the app, at least for domestic calls for AT&T users. 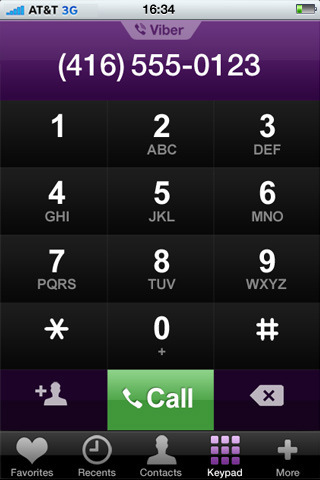 If you are calling internationally often to other Viber iPhone users, then this app might still be of value to you. Viber also has to compete with other services like Skype which has a large user base. Viber needs to work on adding non-iPhone users to their list of customers, including Android and Windows users to gain more traction going forward. AppSafari review of Viber – Free Phone Calls was written by Joe Seifi on December 4th, 2010 and categorized under App Store, Phone, VOIP. Page viewed 27245 times, 4 so far today. Need help on using these apps? Please read the Help Page. I’m sure Viber is very good, however I prefer to stay with Skype for mobile, it does exactly the same but all my contacts are on Skype and you have such a large user base. Click on the boxes to play with the application. Daughter has poor mobile reception with landline usually used by partner, but so far using it through wifi she now has an extra phone….and calling me is…free with quality good and easy set up. GetDialing, you should really think about switching to Viber which has one big advantage compared to Skype: lower battery consumption. We’re very happy to see all your comments and feedback on Viber. First – A NEW VERSION OF VIBER IS AVAILABLE! Second – there is now a special Viber Newsletter for Android users. Call quality on Viber is excellent but it does take an awfully long time to connect. Hope this will be sorted in future updates. I have an iPhone 4 & can’t get an access code. Does it work for iPhone 4 ?? yes, Viber does support iPhone 4.
the problem with not receiving the access code is a different problem for some users, and we still can’t figure out the exact cause. Why does it take so long to connect when making a call on Viber ? Sometimes there is a short synchronization time, but usually it sums up to 3-4 seconds. if it takes much more than that, than it probably has to do with the quality of your connection (WiFi or 3G). this is something we, unfortunately, cannot control. How about overseas call for viber users? Is it free as well using 3G from other countries? edwin – 3G charges depend not on us (Viber), but on cellular providers. we provide the service itself for free, as long as you are connected to the internet. the way you choose to connect to the internet (WiFi or 3G) is up to you. WiFi is always completely free. 3G may cost you, but for information about charges, and especially roaming charges (outside of your country) – you would need to contact your cellular provider. This is the Viber Team. As we promised, I am now excited to announce that we have a new solution for the SMS-code problem! Please let us know if this really helped you activate and use Viber. My iPhone 4 only vibrates once, when people call me. But my wife and friends 3Gs keeps vibrating until the call is accepted or declined, as it should do. Bug? Or me ?? I think you are talking about a general iPhone feature, and this has nothing to do with the application called “Viber”. No – its the software that has a bug. I have two iphones. A 3Gs and a 4. Both is in vibrate mode. But my iPhone 4 only vibrates once, when an incoming call is coming from Viper. My 3Gs keeps vibrating, as it should. This very day, I just checked with my colleagues, same problem for those using Viper on their iPhone 4. It only vibrates once on incoming calls, and not until a choice has been made – either to hang up, or answer! We have not enountered such problem so far. Viber, in general, does not support Vibrate option at all, so your problem is strange in my eyes. I suggest you visit our Support Forums at http://support.viber.com and explain your problem in detail there. I have not used this program and look forward to use to give you more clear information. Hey what does it charge? Does it charge 3G if your using 3G and your doing international or provincial calls? I just wanted to add that Viber for Android will be available around February-March. Also – a new SMS (text messaging) service will be available, for free of course, through Viber on January-February. I experience the same issue with the vibration on incoming calls on viber. On silent mode, the phone only vibrate once. I tested this on 2 other Iphone 4 with the same result. Can someone frm viber pls test this on the iphone 4 and help fix this bug. Right now its very difficult to notice any incoming calls on silent mode. We are aware of the vibrate problem in our currently available version of Viber. We are working to fix it right now, and a fix will hopefully be integrated in our upcoming new version that will be available on AppStore. when I receive a call using viber from another viber user, there is no sound, and I have to turn on the speaker….can you help me with this????? 2. We are releasing a new version (1.1) this week. When it is available, I recommend that you download it and install it over your existing one, and hopefully it will solve your problem. If you have any further questiosn don’t hesitate to ask. At what stage are you stuck? you downloaded Viber, installed, entered your number and clicked the “Continue” button. Now what happens? do you move on to the next screen? Can I download Viber on my computer, as I use Skype at the moment and would like to use Viber on computer with video link? Viber for PC is not available right now. It is something we plan in the future, but unfortunately we don’t have an exact release date yet. Do both sides have our latest version, Viber 1.1? Also – is the other side using 3G or WiFi? Please have both sides uninstall then reinstall Viber, then make a call on WiFi. Does it work now? Hey, I just wanted to ask when is it viber for iPad gonna be released with whole compatibility! I’m really looking forward to having it! Hi, I can’t find the activation code and I really need it, can the viber team send me an activation code? Viber is already compatible with iPad. connect to WiFi through your iPad, download Viber, and begin registration. let me know if you encounter problems. You can simply register again and get a new code, then install Viber and start using it again. Have you tried? Viber, thanks fir helping, but when I open it it doesn’t cover the whole screen, just if I touch a botton at a corner. But then I can’t see it very clearly… Do you know because of what it is? Is Viber available for iPod to iPod calls? we don’t support iPad and iPod-touch officially yet, but it’s definitely usable and people all around the world are using Viber on their iPads and iPods freely. There may be some glitches, but it should overall work and you should be able to make calls. Hi, I have an iPad and an iPhone, and I wonder if I could use them both with the same telephone number (I mean, if I can register the same telephone number in both). Which of my devices will recieve the call if the call me? Both of them? That’s a popular question among our users, but unfortunately the answer is that Viber can only be used with 1 device simultaneously (per number). What you still can do, however, is assign a different ‘real’ phone number to your second device. For example: take an old cellphone number that you don’t use, then register your iPad with that phone number. after registration, you’ll receive the code on your old cellphone, and use that code to activate your iPad. Okay, thank you. What I’m gonna do is to take an old phone and use it. There won’t be any problems if I use viber while the old phone is shut off, will there? If someone calls your old phone’s number THROUGH VIBER, only then will the call be routed to your Viber. Viper activation code SMS cost me 3 euro to receive the text. Maybe thats why some people dont receive their activation code?? They cant get money in return for it ? So no money no code?? The activation code you receive from Viber is free of charge. Viber itself is completely free of charge. we (Viber) are not responsible for very specific, costly contracts a user might sign with his cellular company (such is paying for incoming SMS messages, or high prices for 3G connection). Make sure – we (Viber) do not benefit anything from any charge you might pay your cellular company. Probably one of the best VoIP application avaible on the App Store for iPhone! Are you having problems calling using Viber? is it available for HTC p3400i? I am really impressed with this app as its very well designed, smooth, free to download and absolutely hassle free. Its compatible with wiFi and 3G and thus connectivity is awesome. I am recommending it to all my dear ones. @reimaliraqia – what exactly is the problem? I’m not quite sure I understood. Please try to elaborate so I can help you find a solution. when it first came out it was cristal clear, but then since the updates start coming it mess up, crashes all the time….. until now! What phone do you have? Which OS version? Great for international texts, but when I try to call internationally I am not able to hear the person, but they hear me fine. Does this have anything to do with at&t or just typical international calls? Hi, this is a representative of Viber Media. 1. What devices do both of you have? 2. Did both of you try to make a Viber call to other people? What are the results? 3. Did you try calling each other when connected to different WiFi networks? Find it in AppStore or Market. Beware use the viber in USA making international calls using AT&T. They have charged me of exact a copy of a viber call. Luckily I have saved screenshot from yt call and I not understand how they do. They also stop calls using viber if u not are an AT&T customer. Even more scary. I stop all data when I go overseas and only use wifi. Viber itself – the app and the service – is totally free, meaning we (Viber) don’t charge anything from you. Since Viber uses the internet to function, both sides of the conversation must be connected to either WiFi or 3G. If a user is connected to WiFi – that user is not paying anything for sure. If the user is connected to 3G, the user *may* be paying his cellular company for the data (Viber uses 0.25MB per minute of call), but that depends on the specific data plan that he has with his cellular company, and needs to be verified with them. 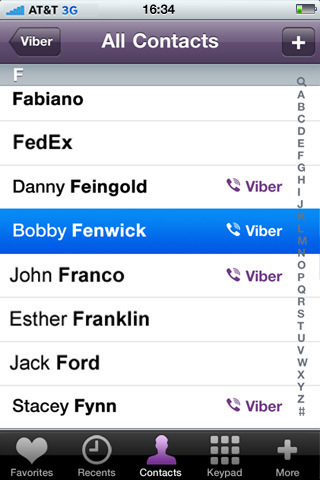 Viber team: is there a preferences menu with an option to set up auto-answer for a configurable list of callers? This capability is critical to my intended use, and would differentiate your product. Unfortunately this option does not exist, but it is a very good idea for future versions. I think this app is extremely useful. I used it last month to keep in touch with my girlfriend who traveled to Ethiopia for a few weeks. Although we had to wait until she had access to WiFi (hard to find in Ethiopia), it was still WAY better than racking up the phone bill because of international calls or texts. I also really like the stickers! Some of the free sticker packages are really funny, and the animals are cute. Overall, I have had a great experience with Viber, and I am very glad I found this app. Posted on April 5th, 2014 at 5:55 pm by Matt C.